I'm trying to retrieve historical stocks fundamental data from Bloomberg to backtest some quant ideas. I'm having trouble to find the correct point in time the data was available. For instance, the EPS time series returns the dates related to the company reporting period, but that's not the day when the information was publicly available. Usually companies announce the results some months later. What is the best way to retrieve these fundamental data from Bloomberg for backtesting? =BDP("AAPL US Equity","IS_EPS", "FUNDAMENTAL_DATABASE_DATE=20141231") returns 6.49 which is what their fundamental database had available on 31st Dec 2014 and was their full year EPS for Fiscal Year ending 27 Sept 2014. If you use =BDP("IBM US Equity","IS_EPS", "FUNDAMENTAL_DATABASE_DATE=20141231") for IBM whose year end is in December then this displays 15.06 which was their 2013 year end as the 2014 EPS number of 11.97 wasn't yet available. 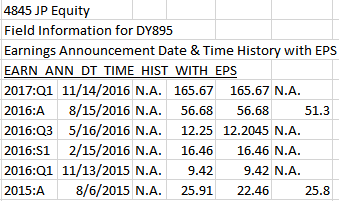 Changing the formula to =BDP("IBM US Equity","IS_EPS", "FUNDAMENTAL_DATABASE_DATE=20150228") then reflects the 2014 EPS a by this time it had been published. HELP HELP (green buttons at top to contact support) although based on my experience i try to avoid because hassle and they are always trying to sell a damn terminal. where are you trying to backtest? bloomberg? or trying to export the data (i.e. excel)? You can use =BHP(....,) to download the historical data from Bloomberg...to download the latest data you can use BDP instead of BHP. Not the answer you're looking for? Browse other questions tagged quant-trading-strategies backtesting historical-data bloomberg or ask your own question.